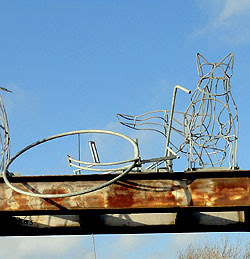 The York to Selby rail trail - which features a must-see scale model of the solar system - also has an intriguing sculpture on the bridge over the Ouse, a couple of miles south of York, near Naburn. 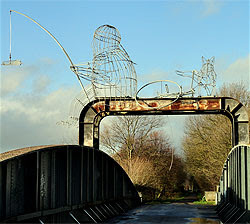 It features a Dilbertesque man made of wire, fishing from the bridge, his bike laid down behind him. He has evidently just caught a train (geddit?). 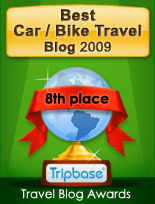 What I only spotted recently, though, was that the dog accompanying him is clearly peeing on his bike. 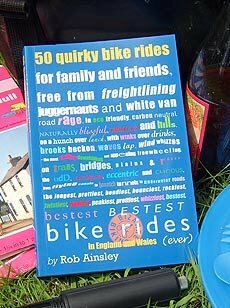 I rather like this; it's an appropriate comment on how cyclists and our facilities are treated generally. 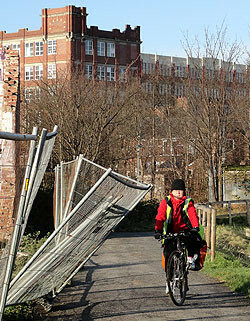 Such as here, for example, on the cycle track in the centre of York, near the Nestlé factory, yesterday. The fencing on the edge of this building site collapses regularly, providing a nasty potential hazard for inattentive cyclists on dark evenings. Unless, of course, it's more ironic wire sculpture?